Many of the country's top music artists are staging a concert on January 15 to raise funds for the rehabilitation of Yolanda-hit communities in the Visayas. 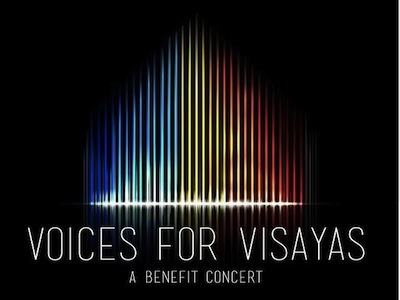 Organized by Smart Communications Inc. (Smart), in partnership with Coca Cola Bottlers Philippines, the concert hailed as “Voices for Visayas” will be held at the Newport Performing Arts Theatre in Resorts World Hotel, Pasay City. All proceeds will go to the Philippine Disaster Recovery Foundation (PDRF) for the funding of the shelter projects of Habitat for Humanity and Gawad Kalinga for the typhoon survivors. Top-billing the concert are Megastar Sharon Cuneta, Asia’s Songbird Regine Velasquez, Asia’s Queen of Songs Pilita Corrales, Concert King Martin Nievera, Maestro Ryan Cayabyab, Singer and Songwriter Ogie Alcasid, and Pop Diva Kuh Ledesma. They will be joined by fellow top performers such as: Mitch Valdes, Robert Sena, Isay Alvarez, Leo Valdez, Erik Santos, Bituin Escalante, Karylle, Jay Cayuca, Jed Madela, Menchu Lauchengco-Yulo, and Andrew Fernando. Performing groups meanwhile include The Philippine Madrigal Singers, The Company, Ballet Philippines, Bayanihan Philippine National Dance Company, Douglas Nierras’ Powerdance, Ryan Cayabyab Singers, Mandaluyong Children’s Choir, and Primo. Ticket prices are at P6,000.00, P4,000.00 and P2,000.00 respectively. Tickets are available at the Resorts World Box Office with contact number (02)9088000 local 7700. “We are thankful to all of the many artists and sponsors who have come together to make this a meaningful event for the typhoon survivors. Now that we are at the rehabilitation stage, it is critical for us to keep up the momentum of support. Proceeds of this concert will go to Gawad Kalinga and Habitat for Humanity for the rebuilding of houses and shelter in the affected communities,” says PDRF President Butch Meily. Set up to facilitate private sector preparedness for and response to disasters, PDRF has initiated efforts to repair and rebuild classrooms damaged by Typhoon Yolanda and to revive local businesses in the affected areas. In addition to this benefit concert, Smart continues to help typhoon survivors through its global multi-channel crowdfunding campaign helpPH and through partnership with aid organizations and international charitable institutions.